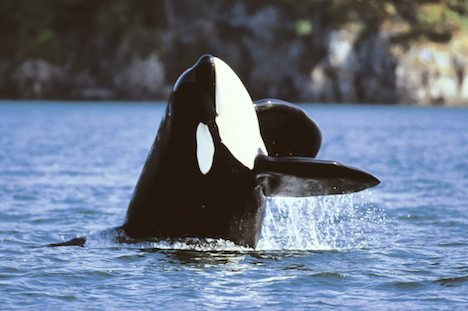 The Northern Resident Orca whales, spend most of the summer off the coast of Northern Vancouver Island. Among some of the usual social behaviour exhibited by these whales is breaching, spyhopping, and playing in kelp. Orca Whale (aka Killer Whale) beginning a breach off the coast of Northern Vancouver Island, British Columbia, Canada. Picture of a breaching orca whale off Vancouver Island, BC, Canada.